We love the website www.DAILYCARING.com. It’s a terrific resource for those not only caring for seniors or partners where Alzheimer’s or dementia are involved, but frankly, it’s a treasure chest of ideas for no small number of medical and mental health communities. 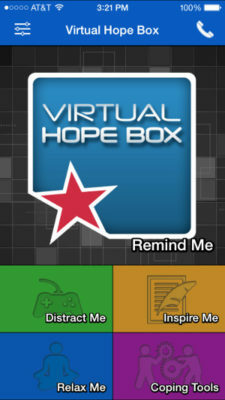 They ran an article recently, focusing on a FREE phone app for caregivers called the VIRTUAL HOPE BOX. It’s an impressively practical tool directed at helping to reduce stress for caregivers. It’s customizable and wonderfully access friendly. “How does Virtual Hope Box help caregivers? Quite honestly, it’s worth checking out no matter who you are, because stress hits ALL of us. We could have just placed a link for the app itself, but we encourage you to check out the DailyCaring site’s article as they’ve laid out the details of the Virtual Hope Box app.